Santa Teresa County Park is a bit of a rarity: A park that features some seriously fun singletrack trails in the southern part of Santa Clara Valley. The total trail length here doesn't add up to very much (especially if you count just the singletrack), unless you do multiple loops. So, I don't know if everyone would agree with me that it's a worthy riding destination even for those who live in places that are far from this park, though I've never regretted driving down all the way from San Francisco to ride there. Just know that, if you consider yourself a serious mountain biker who likes technical singletrack, you'll be missing something unless you try Stile Ranch Trail and (especially) Rocky Ridge Trail at Santa Teresa. Parking at Santa Teresa County Park is subject to a fee. The fee is $6 as of this writing. You'll have to pay at an unattended machine before leaving your car and place the receipt face-up on your dash. The machine does accept credit cards (in addition to cash and debit cards, I believe). This ride does two loops in a "figure eight" that seems to be the most typical route for mountain bike rides in this park, though the direction preference for each of the loops might change from rider to rider. The ride also includes a couple of side loops on Bernal Hill, which are entirely optional and don't provide mountain bikers anything more than some pretty views. Altogether, only about 35% of this ride is on singletrack, although some short parts of the remainder is on fire roads that have been narrowed by vegetation into something of a pseudo-singletrack in some places. The "western" half of the main figure eight of this ride's two loops is traversed counter-clockwise. This allows you to descend the series of technical switchbacks on Stile Ranch Trail, near the southwestern corner of the park; although, no matter which way you do this loop, you'll have both climbing and descending sections along Stile Ranch Trail. As I mentioned, this trail is very rocky and quite technical, especially in some sections. While, in earlier years, I used to consider Stile Ranch to be less technical than the rocky stretches of Rocky Ridge Trail, the chunky portions of this trail have weathered into a more advanced state in recent years (perhaps beginning around 2013) and parts of it probably involve a higher pucker factor than the toughest stretches of Rocky Ridge these days. It may have aged into an even tougher trail by the time you read this. Inexperienced riders should consider themselves warned. At the beginning of the ride, you start out by traversing the Bernal Hill Trail loop and Vista Loop. These consist of fire roads. Other than the views that you get to see, Bernal Hill Trail has one rocky descent (if done clockwise) that provides a little technical enjoyment. The views are not much better than what you can see from Coyote Peak on the second loop, so you can safely omit these side loops, unless you're curious. Bernal Hill Trail also has one of the steepest climbs of the ride that reaches something like 29% grade at its steepest spot. Once you finish Stile Ranch Trail, Fortini Trail is another singletrack that will take you part of the way back to the parking area of the park. It's nothing like Stile Ranch. It's shorter, straighter, and flat on average. But, it's still a cute trail. 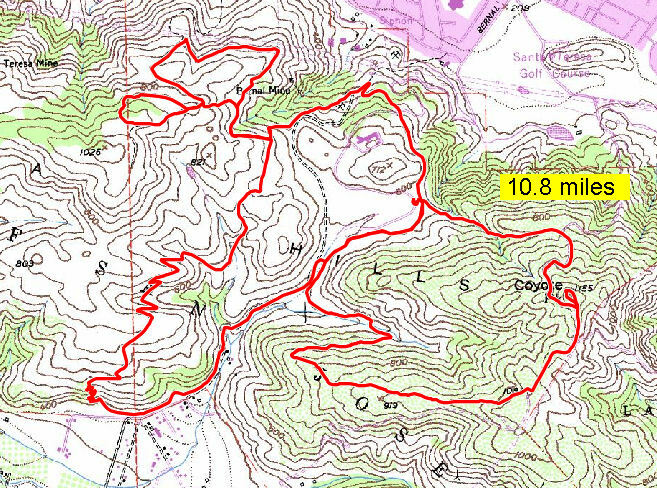 The second loop is clockwise and has you climbing up to Coyote Peak via Hidden Springs Trail. This is a serious climb. It lasts close to one mile (though there's a bit of a break in the middle) and the overall average grade is just over 12%. There are some stretches where the grade is just under 20% for quite a while. This ends right near Coyote Peak. If it's your first time riding here, it's worth visiting the vista point atop this peak to take in the views. A short stretch of gravel road after that (Coyote Peak Trail) brings you to the beginning of Rocky Ridge Trail. You'll be descending this beautiful as well as challenging singletrack trail when the loop is done in this direction. In my opinion, you'd have to be either nuts or masochistic to do it in the opposite direction. Rocky Ridge Trail starts out as a flowy ridgetop singletrack. It slowly gets rockier and rockier. Once you turn around and start the segment of the trail that's heading east, you arrive at the most technical sections. If portions of this trail don't qualify for a black diamond rating (if not more), I'm not sure what would. Still, none of the features are of a kind that would really endanger the rider, because the trail's attitude never gets extra steep and you always have the opportunity to stop to walk across any part that you don't think you can stomach. Note that a short portion of this trail where it crosses a stream bed at the end of its descent has been re-routed since the time of my ride and the trail now cross the stream via a bridge at a different spot. This is not a big enough change to alter your experience of the trail or to pose a navigational challenge, but I wanted to point it out anyway in case you follow the ride on the screen of your GPS or compare your track after your ride and notice a discrepancy with what's plotted here. Despite having these (at least) two beautiful and well-designed singletrack trails, much of the rest of the trails in Santa Teresa feature frequent steep climbs, though most of these are short. So, if you're not in good shape, it'll make you suffer a little. For that same reason, it might not be the best place to bring a beginner ride partner, unless that person is okay with walking the bike up many climbs. If you have a car with you, there's no shortage of places to eat or relax a little within a short driving range after a ride at Santa Teresa. However, one of the closest options is an easy recommendation that might be overlooked: There's a Mexican restaurant called "El Amigo" at the intersection of Bernal Road and Santa Teresa Boulevard. Their food is decent, they have a huge outdoor patio that's shaded by a fabric canopy that can accommodate tables for large parties, their free chips and salsa are pretty darn good, and they seem to have a passable beer selection. The combination of these factors brings this place pretty close to being an ideal post-ride meal spot in my book.